This is a two-story clapboard and shingle house with a medium hipped shingled roof and overhanging eaves and brackets. On the second story left, there is one double-hung window. Below, there is a large fixed window with flanking narrow windows separated transoms. On the second story right, there are two double-hung windows. Below is a slant bay with a large fixed glass window in front and narrow double-hung windows on the sides. On the far right, there is a narrow two-story wing with paired windows. On the left side, an upper bay supported by carved brackets accents the recessed entrance. Open porch with wooden balustrade. Steps. Lawn, trees, palms, shrubs. Stone wall. Driveway on left. Garage at rear. Designated City of Santa Barbara Landmark (08/06/1991). 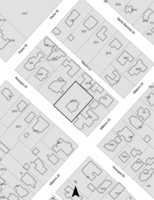 f. The site exemplifies the best remaining architectural type in a neighborhood. This large, two-story residence dates from the Edwardian era and has architectural design elements from the Craftsman style. The imposing home, with its satiny wood interiors, understated landscaping, rear cottage and garage, has recently been lovingly restored. The interior boasts twin sun rooms, ten-foot-high ceilings, four fire placesm four bedrooms and a library. Its historic significance is due, however, more from one of its occupants rather than its appearance. 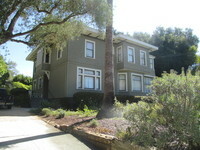 In 1903 Hezekiah Griggs Chase of Boston began his real estate agency at 728-730 State Street in Santa Barbara. The next year, he brought his family to live with him. His wife, Maria, and two teenaged children, Harold and Pearl, arrived from Boston and moved into the house when it was new. The H.G. Chase Real Estate Agency relocated to 1012 State in 1917. Except for the death of Maria in an auto accident in 1913, both the Chase business and family flourished in Santa Barbara. After taking time away to attend U.C. 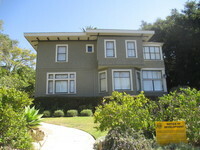 Berkeley, Pearl remained unmarried and lived in the Anacapa Street home until her death at age 90 in 1979. For over six decades, Pearl devoted herself to community improvement and civic betterment causes. She helped to found the Plans and Planting Committee of the Community Arts Association in 1922. This group was instrumental in the creation of a uniform Hispanic design style for the City after the 1925 earthquake. Her brother Harold also went into the local real estate business and developed Hope Ranch for residential use. Pearl won awards for her civic work eventually becoming one of California's most honored citizens. Accomplishments include her efforts to assist the reconstruction of Mission La Purisima in Lompoc during the 1930s, the founding of the Santa Barbara Trust for Historic Preservation in 1963, working as the champion of numerous Native American causes, the donation of "truckloads" of local historic documents to the UCSB archive, and a key participant in the Better Homes design competition from 1925-1941. Many of these activities, which still benefit contemporary Santa Barbarans, were coordinated from this home.